We will now embark on our journey to the roots of the Muniverse by redefining the current measuring units of HScience, because all of them fall short of their real values. Units like the velocity of sound or light can be measured physically and you’ll get close, but to get to their real values, you need the right Divine formula. You will get close to defining the second by means of measuring, but to get to the proper length of a second, you need the right formula, then measure. The same goes for calculating the Astronomic Unit (AU) and a lot of other units of mass for the earth, the Solar System Centre (SSC), galaxy, yes even the mass of the universe! 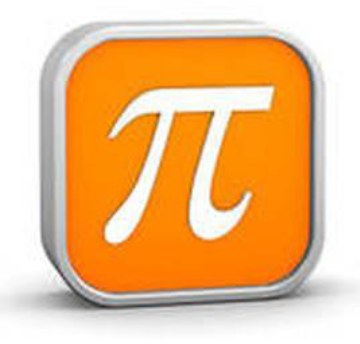 Even for a necessity like π you need the correct formula and not 6 trillion or more digits! And once you have the right formulas the sky is certainly not the limit. These formulae are guarded by one or both of two Primordial Numbers. These Primordial Numbers are derived from the very first entities that were present in the Creation, namely Darkness (Khoshek – H2821) and Light (Ore – H215). 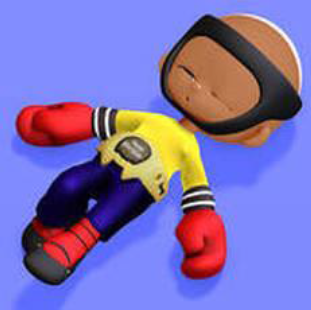 KHOSHEK AND ORE... It’s a Knock Out! ​Khoshek (K): This word refers to the physical creation of which Earth and her myriads of sister duplications are the crown jewels, because they are used as Mother’s Wombs, where the Heavenly Generations are generated and live as humans and where they are prepared for their birth into the heavenly dimension. The numerical value for the Khoshek Primordial Number (K) is 12740. This Zereth is then the first measuring unit to be directly derived from the Khoshek. In Isa.40:12 it is written: “Who has …… measured out the heavens with a span? (= H2239) This Biblical Hebrew unit means the “spread of the fingers”, in other words the hand. However, the hand referred to here is certainly not the human hand but the Divine Hand. The distance of this Zereth (Z) is 12740Km and this is the diameter of Chronos-earth, a virtual earth, the nitty-gritty of which we shall discuss somewhat in a while, but more so in another article. However the measurements of the earth (Kairos-Earth) we are living on is derived from this figure which means that the earth, after all the ‘deformities’ on its surface areas are accounted for and it is transformed into a perfect sphere, is an exact 12740 kilometres in diameter. And let me add this little bit of trivia about the kilometre: Although the gentlemen who first proposed the length of a meter as a 10’000th of a quarter of what they thought was the polar circumference of the earth (40’000Km! ), this ‘mistake’ was in fact a divinely inspired correct interpretation- The meter and kilometre are correct measures! This may sound a little bit farfetched to the scientific mind, but hang in there until we start to use these numbers. On the surface of the earth the zereth (z) (notice the lowercase ‘z’) or human hand as it should be translated or five fingers as it is intended will also be translated into a chief measuring unit. This zereth will be 127.4mm in length, which is one part in 100’000’000 of the true diameter of the earth. The Zereth and the zereth can thus be respectively understood as the ‘Divine Hand’ and the ‘human hand’. One hundredth of a hand or 0.01z (1.274mm) will also be regarded as the divide between inner and outer space. Now, without further ado, let us see what the primordial numbers will lead us to. In the very first place it produces the sonic second. This is the prime measure of speed on the surface of the earth, and in the Human Zone (a radius of 1Ls surrounding the earth-centre). It is the velocity of sound in the atmosphere at 20°Celcius, in Kilometres per second (Km/s). For this measure, you simply divide Khoshek by Ore and… voilà! This gives us the prime Mach number (M1) = 0.344324324…Km/s. The Sonic Second can be used both as an expression of distance and that of velocity. All velocities on the earth’s surface and in the air can be expressed in Sonic Seconds. In other words, 1Ss = 0.344324324… Kilometre per second, as well as 0.344324324… Kilometre. The third and surely most important measure in the vast expanses of the universe is the distance light travels in a vacuum in one second – the Light Second (Ls). Modern science has indeed NOT succeeded in getting very close to the real thing with their 299792458 meters per second. To measure out the human zone with that distance may not be too bad (only about 57.135m short! ), but in the vastness of outer space this is certainly inadequate. Beyond the Human Zone (including the radius of the human zone) all distances are measured in light seconds. It may seem strange that it is not light years, although light seconds can be converted into light years, but you need to have all the relevant formulae! Only then can we start to use Light years (Ly) and even the unit of the Galax (G) (100000Ly). The velocity of light is then generated by multiplying the divine number of 870669 with the Khoshek and divide the answer with the Ore (870669K/O) or simply multiply the velocity of sound with 870669, which generates 299792.515135…Km/s. This means that the Mach number of light is M870669. This correct value is 57.135 meters more than the current length of the unit of the Light Second (Ls) as generated by HScience (human science). Now we have 2 very important measurements of the Universe. They are divinely inspired and are 100% correct. However, they are expressed in distance per second, so it is just obvious that the very next thing that has to be verified is the length of a second. This turns out to be a little trickier, because despite all the refinements of HScience, it is hard to measure time against the behaviour of a very erratic earth in its revolution as well as its orbit around the sun. For this purpose, one needs to place a virtual earth next to our earth and do the calculations on the virtual earth. We call the virtual earth Chronos-earth, while we do our living on Kairos-earth. Now Chronos-earth does nothing else but indicate the correct time, while Kairos-earth is adapted to sustain life. Like Khoshek and Ore, the one cannot go without the other. In order to draw a map of the Solar System and the important role the earth play in it, one needs Chronos-earth. This virtual body is a smooth and perfect sphere with a diameter of 12740Km. It orbits the sun in an apparent 365.24215 days, but its ‘seasons’ are divided into four exact quarters. But, if we want to define time precisely, a year is too short to base our calculations on. For this we need a new measurement we call the Æon. It is the counterpart of the word Aion (G165) which very aptly describes the ‘world’- that is the peoples generated on the earth in a certain period. The peoples are called collectively an Aion (A), and the period in which the successive Aions are generated is called an Æon (Æ). 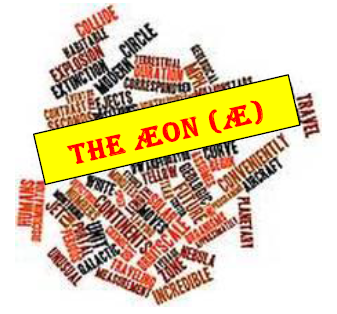 There’s a lot more to be said about this Æon, but I don’t want to fast-forward this article. Suffice to say, an Aion is a heavenly Generation that is produced on earth after every Æon (see Gen.2:4). And what is the length of the Æon? This is again a divinely inspired 8.4million years, but we have the formula for it, and the formula will justify itself. Now the correct amount of seconds in an Æon can be derived from multiplying the divine number 562345 with K and O (562345KO). The answer is 265078186100000 seconds (s). 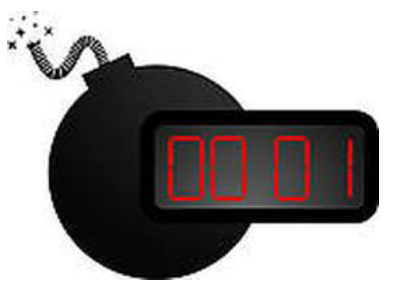 ​This total amount of seconds can then be used to produce the year by dividing it by 8400000. The answer is 31556926.91666… s/year. There is another formula to work out the days per Æon: One simply multiplies the divine number of 240819 with the Khoshek (240819K) and you’ve got it: 3068034060 days/Æ. To work out the days per year you just divide again by 8400000years: = 365.24215 d/y. To work out the amount of seconds per day, you divide 265078186100000 with 3068034060. The answer gives you the number of Sonic seconds (Ss) per Chronos-day: 86400.01411848732865762252978378. Humans use the round figure of 86400 seconds per day, but now that they are more capable to do that universally, the value of the current human second (Hs) must be adjusted to keep time on earth in synch with Chronos earth and the rest of creation. The current human second of 86400 generates the amount of 265078142784000s/Æ, which is 43316000 less than the real value per Æon. This means that every year human time must be adjusted upward with 5.15666… s to keep in sync with Chronos time. In order to prevent adding “leap seconds” every year, the length of the current second will have to be adjusted upward to be 86400.01411848732865762252978378/86400 = 1.0000001634084181557595200206456 times the length of the current second. That would still give the same number of seconds per day of 86400 to facilitate the division of the day in minutes and hours, but human time will be in perfect sync with Chronos time. As we’ve just seen, The Chronos year is an exact 365.24215 days. However, the Kairos year is slightly adjusted, to accommodate the Torah Prophetic Calendar. This means that two historic moments in time must be exactly in sync. Those two moments are the time of the Exodus of Israel from Egypt, and the Crucifixion of Jesus Christ. Those two points are 1279 years apart, with the Exodus in 1249BZ (before the Zero) and the Crucifixion in the year 30AZ (After the Zero). However, the time after 1279 years will be 467144.70985 days, which will be 0.29015 days shorter than an exact 66735 weeks. To sync these two points in time, the orbit of Kairos Earth is slightly speeded up, to do 8400000 orbits in 3068034060 - 0.29015 = 3068034059.70985days. That means the Kairos year is slightly shorter than the Chronos year at 365.2421499654583… days. Then, on a certain predetermined day, during the Exodus under Joshua, this 25068.96 seconds are added again, when the “day is lengthened” (Jos.10). we will discus the mechanics behind this operation in another chapter. The synodic month is also altered to accommodate this 1279-year sync, but we will discuss this when we have a look at the moon. ​Astronomy is quite correct in accepting the AU as a measuring tool in the vast expanse of space. The one problem up till now is the lack of precision regarding this measure. The ‘old AU’ was meant to be the distance between the earth-centre and the sun-centre, but the sun is the second of five nodes that regulates the ‘tail’ of the Galaxy. We’ll discuss the mechanism of the Galaxy in a later chapter. The sun has different revolving velocities at the Polar Regions and the equator and the sun-centre orbits around the solar system centre like the rest of the system. This orbiting origin of the sun centre and the rest of the solar system is the very centre of what is called the Joseph Throne Room (JTR) with the same real name of the Milky Way Galaxy (Galaxy Joseph). The sun-centre revolves around the JTR. The radius of the JTR is 2736.011868 … Km, which is the radius of the Gravitug of the Solar System. The sun centre revolves around the periphery of this stable JTR. The two moments per year when the earth crosses the AU-line, JTR’s centre (also the Solar System Centre) is an exact 500Ls or 149896257.567567Km from the earth centre. The AU is then taken to be this 500Ls. This is explained more lavishly in a following article. In a Universe where all the bodies move around in circles, it is of paramount importance that the correct π Number is established. HScience does NOT have this one right. The biggest circle that can ever be drawn is that of the complete Universe. Now God is a GOD OF ORDER! There is simply no chance in the world that the circumference of the Final Circle in the creation will peter out into a never-ending series of digits. It is just bound to be rounded off to a round figure into which the diameter of the earth can be divided, true to what is written in Isa.40:12 – “…the heavens measured out with a span.” This means that BOTH the Diameter as well as the Circumference of this circle must be divisible by the diameter of the Divine Span of 12740Km or Z1.0! 53’466’106’381’506’000’000’000Z, the diameter of Universe Temple. This goes to show that with a mere 50-digit calculator one can do all calculations in the Universe about the π number very comfortably and with complete accuracy. ​Now we are ready to turn to the measurement of the speed of the solar wind. The sizes of the circumferences of the four-disc (yes!) solar system is marked out by the distance the solar wind travels in a day. The rotation velocities are also determined by the Solar Knot, because, like the Sonic Second and Light Second, this measurement is both an expression of distance and velocity. However, because of the great velocity of the solar wind, as well as the vast distances of the solar discs, the expressions of solar disc rotation velocity and size will be rendered in the distance the solar wind travels in a year against the velocity of the disc-edge per annum. There is no formula for the velocity and distance of the Solar Knot. Here we must work on a Divine Given, but the result HScience will be perfectly able to confirm. We now have the exact length of the AU (500Ls), the corrected Light second as well as the corrected π Number, so it’s easy to determine the correct distance of the earth’s (Chronos as well as Kairos) orbit around the sun. Now for the Divine Given: The Solar Wind takes 25.2 days to travel this distance. This will give us a velocity of 37374046.156736…Km/d (Kilometre per day) thus 432.569907…Kilometre per second. Therefore the perceived velocity of the earth’s orbit around the sun is expressed as 25.2SWd/a, or 0.068995…SK, or 29.845300…Km/s. This means that any fluctuations in the solar wind speed must also be expressed against the unit of the SK. The moon plays a cardinal role in determining the correct time for the religious calendars. The religious years and just about all the feasts of the different religions are determined by the moon. This can be done in conjunction with the sun, which renders different lunisolar calendars. The religious lunar calendar of Islam is totally independent of the solar calendar, but is also necessary to complete the picture of Time on Mother earth. We will discuss the different calendars independently and will also produce a Master Calendar that will reflect all the different movements of the sun and moon in conjunction with the Zodiac, which will portray an immaculately accurate mechanical timepiece that will eventually link us up with the time in the Galaxy and the greater mechanical universe. What we will do here is just determine the exact length of a mean lunation and how this will be used to determine the beginning of the lunisolar year, as well as determine the first day of every lunar month, which will be a synchronised action for all the lunisolar and lunar calendars. As with the movements of the earth, the erratic movements of the moon cannot be correctly determined by observing and measuring those over any length of time. The moon’s lunations are also determined by divine formulae that are guided by Khoshek (K = 12740) and Ore (O=37000). There are 3068034060 (240819K) days per Æon. During this time, there should be 3068034060/30 = 102267802 lunations. However, because the moon revolves on a gravitation disc that is centred between apogee and perigee, and the fact that this disc also rotates on its axis, the 30day lunation is shortened as follows: 102267802 + (0.1Kx0.1K) + (0.1K +0.1K) = 102267802 + (1274x1274) +(1274 +1274) = 103893426 lunations per Æon of 3068034060 days. This generate a mean synodic month of 29.530588971048081521539197292425 days. However, like the Kairos year, the synodic month is also adjusted to accommodate the 1279year time sync. In 1279 tropical years there are 15819.010935 synodic months, but it must be kept in mind that the day of the sync is lengthened by 0.29015 day. That means the synodic sync month had to be lengthened by 0.279215 day, to produce an exact number of 15819 lunations over the 1279 years. This 0.279215 days thus must then be deducted from the 3068034060 days. The real synodic month is thus 3068034059.720785 / 103893426 = 29.530588968360567876546876026593 days. ​The Mean Lunation Calendar is the basis around which all lunisolar calendars, as well as the lunar calendar will be set up. The real synodic month never drift more than 7 hours (+ or -) away from the mean lunation, which means that the determination of the first day of the lunar month can never be more than a day earlier or later, as the first day of the lunar month starts at the first sunset that follows the exact new moon phase that falls within the 24hour period of the solar day. However, as all calendars for the 6th Generation will move away from determinate to observational, HScience will be asked to draw up an Observational Lunation calendar for the 7200-year period starting at 5000BZ and going through to the year 2210AZ, which is the duration of the very important Roman Calendar. All the new information made available by BScience will make it possible to produce an impeccable Synodic Calendar. For humans to come on a par with the divine, our concept of the divisions of Time must change. We must also understand how time on earth is related to Angelic Time and even Temple Time. Currently, humanity works on the Roman / Gregorian Calendar with its rules regarding keeping the calendar in sync with the tropical year. This will change for the 6th Generation (post Great Tribulation humanity), where all mainstream religions (including HScience) will have their own calendars, with a special two-semester Secular Calendar for use by the general secular population which will guide their school, work and play periods. All the calendars will be synced. The way how we divide time in the Human-day will also have to be changed, in order to facilitate mathematics. The day will still consist of 86400 seconds, although the length of the second will have to be adapted to comply with the Time of the Universe. We already discussed this issue. Then those 86400 seconds can be converted into 24 hours of 3600 seconds each. However, the hour will have to be divided into 50 minutes of 72 seconds each, which will bring us right into line with angelic time. Now in order to decimalize time, we work with haymeesoos (hm) of 36 seconds (G2255 meaning ‘half’- the abbreviation can also work as half-a-minute! ), which will give us 100hm per hour. Thus the 5th Generation expression of 13:23:26 (hh:mm:ss) will be decimally expressed as 13:39.055. Now that we have knowledge about the Æon, we can do the exercise of comparing human time with angelic time. In angelic time one also gets haymeesoos, minutes, hours, days, weeks, years and Generations. However, one angelic minute equals one human or tropical year, with the angelic haymeesoos standing in resemblance of the earth’s aphelion/ perihelion/ aphelion semesters, which are exactly equal in length of time. In angelic time there is a Jubilee of 50 weeks to the year, something of which will be mirrored in the calendar of the 6th Generation Christians. The accompanying table illustrates how the two different concepts of time weigh up against one another. 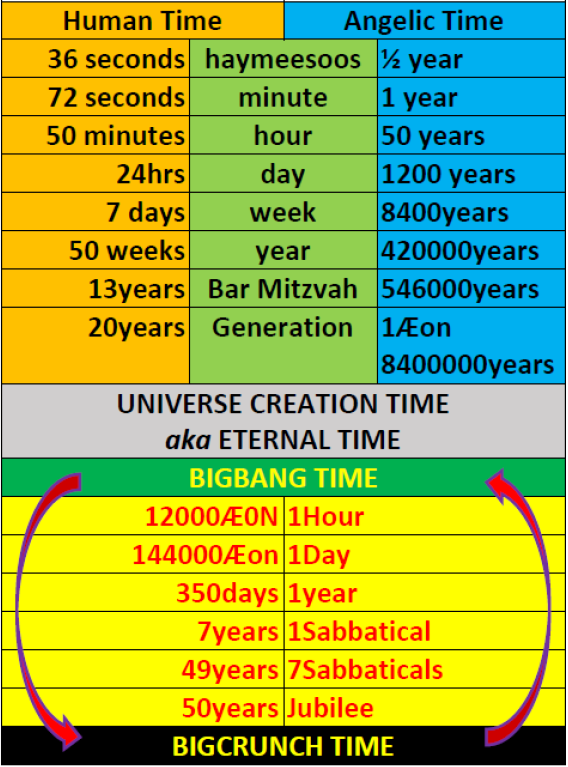 But there is yet a third concept of time which is called Eternal Time, where 12000Æ represent just One Eternal Hour (EH) and where Time reverts to Zero (the big crunch?) after a Temple Jubilee of 50 Temple Years, only to roll down the next 50 Temple Years again. We’ll discuss that concept in a later article. The 6th Generation will also use new units of mass that will be based on the mass of earth. Now the mass of earth and that of the sun cannot be determined completely correctly by HScience which can take only an educated guess. No, here DScience must oblige, while HScience can determine the mass of the other celestial bodies by comparable observation. Like many other divine units, certain formulae that is based on the Khoshek (12740) (or Zereth (Z) = 12740Km) and Ore (37000) are also embedded in the masses of earth and the sun. So the formula for the gravitational volume of earth is ZZO km3 and the gravitational mass is ((volume) x 1e+12) Kg which amounts to 6.0053812e+24 Kg. ​However, the mass of earth is not expressed in Kilograms, but the Talent (T), a new 6th Generation unit of mass. So, in Talents the mass of earth is 1e+23 T, putting the mass of a Talent at 60.053812 Kg. The relation of the mass of the centre of the solar system to that of earth is also not a matter for guesswork. What is regarded as the mass of the sun is in fact the centre of mass for the Solar System and it is the (mass of earth x 9O) = 6.0053812e+24 x (9x37000) Kg = 1.9997919396e+30 Kg or 3.33e+28 T.
Now before we can start with our discussion of the Ultimate Universe down to the Solar System and its layout. We must have a look at the expression of multiple units for outer- as well as inner space. The current system of giga and tera, nano and pica is very confusing and nonsensical. It is like million, billion, trillion, etc. ​These terms are not always similarly understood in different parts of the world. 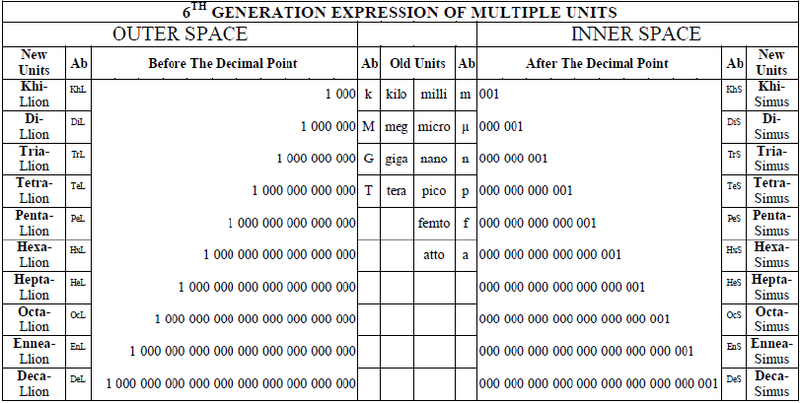 The 6th Generation will have a very simple but straightforward and easily comprehensible way of expressing these units. Any child who is in grade 1 must be able to count from one to ten in their own language. If they are able to do that, then it is just a matter of doing the counting in Greek and voila! They will be able to express most of the dimensions of inner- as well as outer space. From 1 - 999 the counting is in the normal fashion. The Anglicized Greek for a 1000 is khi-Llion (KhL). We use the second part of the word to indicate three zeros and the first part to indicate ‘one’. This means we count normally from zero up to 999 (KhL0.0-KhL0.999), and then comes KhL1.0; then KhL1.0-KhL1.999; then DiL1.0 (Di-Llion) etc. This is doing counting in ‘outer space’. 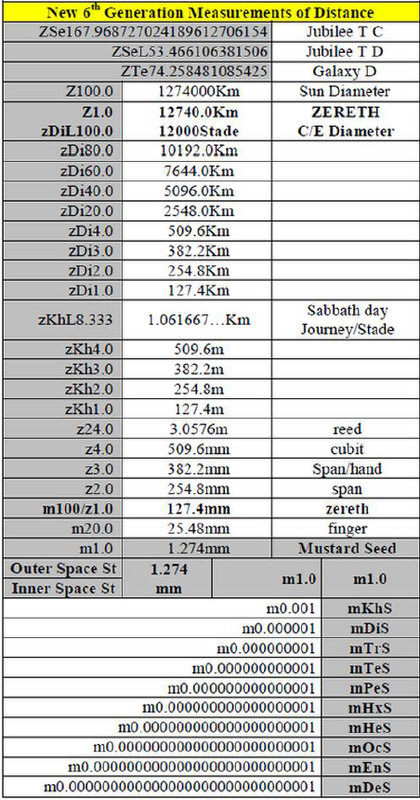 ​The wonderful thing about these measurements will be that one zereth will be subdivided into a 100m, implying that within the length of a handbreadth lie a hundred inner space universes.